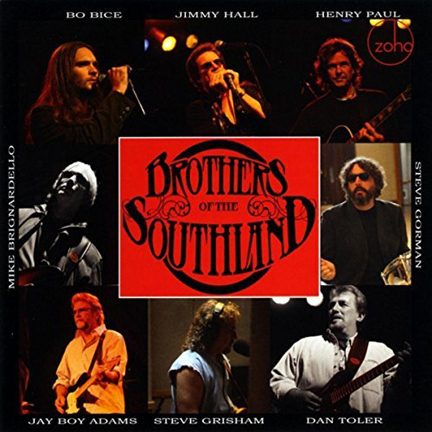 “Brothers of the Southland”, recorded in 2007 in Nashville, aims at nothing less than revitalizing Southern Rock by presenting the genre’s greatest musicians of several generations in a collaborative All-Stars format, including singers Bo Bice (ex American Idol 2005), Jimmy Hall (ex Wet Willie, Jeff Beck, Hank Williams Jr.) and Henry Paul (The Outlaws, BlackHawk). Southern Rock is undeniably one of the great indigenous art forms of America. Its heyday was the 1970s, but its roots go back way earlier than that. It can be argued that the first Southern Rock was recorded in July, 1954 when Elvis Presley went into Sun Studios in Memphis and recorded the blues classic "That's All Right Mama" with his buddies Scotty Moore and Bill Black. Under the production eye of the soon-to-be legendary Sam Phillips, Elvis, a young white southern white truck driver ripped into Arthur "Big Boy" Crudup’s tune in a way that woke up the world. This new music out of Memphis was labeled "rockabilly" or "rock'n'roll", but it was also the earliest example of Southern Rock. Beginning in the mid-1960s, “Soul Music” came out of the studios in Muscle Shoals, Alabama and Memphis. A racially integrated group of session players provided the instrumental backing for artists such as Otis Redding, Sam and Dave, Wilson Pickett, Arthur Conley, Rufus Thomas, Aretha Franklin, Percy Sledge and numerous other, mostly black singers.  This was the fertile musical ground which inspired yet another group of Southern young men, proud of their heritage and possessing immense musical talent, to go into the studios and create the exciting hybrid of blues, soul, rock, jazz and country music which is now known as Southern Rock. The Allman Brothers Band, a group originally formed around guitarist Duane Allman, The Marshall Tucker Band, Wet Willie, Grinderswitch, Delaney and Bonnie, Lynyrd Skynyrd and The Charlie Daniels Band are just some of the great Southern Rock groups who reached worldwide fame in the 1970s. Southern Rock groups created albums and toured constantly. Although there were some hit singles on radio through the years, the essence of these bands was on their albums and tours where they often played extended jams, stretching songs out 20 or 30 minutes as the crowds soaked up the music. Both the musicians and the crowds were consumed by the music, which often lasted all night long. Fast forward to 2006: on a beautiful spring day, a who’s who of southern rock legends is gathered in the Nashville office of veteran record producer D. Scott Miller. George McCorkle - a member of The Marshall Tucker Band - and Scott had invited several of friends over to hang out and listen to music. After a pleasant afternoon of catching up and passing the guitar around, someone suggested that to orm a new band, and write and record a new Southern Rock album. Overcoming a mountain of distractions and geographical nightmares, a plan slowly evolved that would eventually become the Brothers of the Southland. In the summer of 2007, D. Scott called his Southern Rock friends together to begin recording the new album, at Ocean Way Studios, a few blocks off “Music Row” in Nashville. Sadly, the day the recordings began, George McCorkle was diagnosed with terminal cancer and died after a brief illness. As guitarist and founding member of The Marshall Tucker Band, George toured countless miles alongside the Allman Brothers Band, Wet Willie and Lynyrd Skynyrd. George penned many songs for The Marshall Tucker Band, including the classic “Fire on the Mountain”, their first top 40 hit. Singer / guitarist Bo Bice spent his youth moving between Georgia, Alabama and Florida before the family relocated to England when he was twelve. He eventually returned to Alabama and dedicated himself fully to music. Bo’s career took a significant upward turn when he auditioned for the fourth season of “American Idol” broadcast in 2005 and finished in the top 2. His first post-Idol CD, “The Real Thing”, reached #4 on the Billboard albums chart in 2005. Steeped in Southern Rock, Bo here gives commanding performances on the classics “Can't You See” and “Dreams”. "Wet Willie” original founder and front man Jimmy Hall was born in Birmingham, Alabama. He is best known for his spectacular vocals on the group’s feel-good hits “Keep On Smilin’”, “Grits Ain’t Groceries” and “Dixie Rock”. In 1985, Jimmy was nominated for a Grammy award for Best Male Rock Vocalist for his work on Jeff Beck’s album “Flash”. Jimmy’s most recent CD “Build Your Own Fire”, released on ZOHO in 2007, garnered rave reviews in the international press. He tours with Wet Willie and as band leader for Hank Williams Jr. Jimmy brings a variety of musical talents to the “Brothers” with his bluesy saxophone and harmonica work as well as his incredible vocals. Henry Paul, a founding member of The Outlaws and BlackHawk, adds his instantly recognizable voice to the “Brothers”, and also plays mandolin and acoustic guitar on several tracks. Henry was born in Kingston, New York but moved to central Florida in his early years. The Outlaws hit list includes “Green Grass and High Tides”, “Ghost Riders in the Sky” and “There Goes Another Love Song”. In 1992, Henry formed the band BlackHawk and found instant success with the mega country hits “Goodbye Says It All” and “Every Once In A While”. Texas singer- songwriter Jay Boy Adams’ music is a mixture of country, rock, blues, and Americana. Jay Boy began touring with ZZ Top, The Band, Jackson Browne, The Marshall Tucker Band, and Joe Cocker in the 70’s and early 80’s. His current solo CD “The Shoe Box” ranked in the top 10 Americana albums for 2007. Steve Grisham, former Outlaw guitarist, was born in Pittsburg, Kansas. His hit songwriting credentials include “Keepin’ Our Love Alive” and “Fallen Hero”. 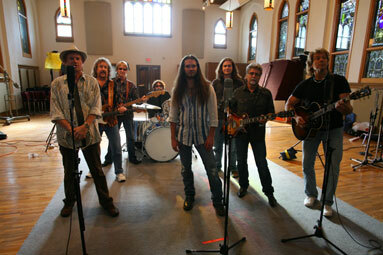 Steve has collaborated with artists such as Steve Gaines, Gretchen Wilson, and Charlie Daniels. He released a solo album in 2000, “The Outlaw Years”, and he is currently playing with his band The Ghost Riders. Dan Toler, also known as “Dangerous Dan” Toler, is a guitarist from Indiana who became popular in the 1970s as a member of Dickie Betts’ “Great Southern”. He was also a member of the Allman Brothers Band from 1978  82, of the Greg Allman Band in the 1980s and 90s and of again of a re-formed “Great Southern” in the 2000s. Steve Gorman, a founding member of the legendary “Black Crowes”, has a long and rich tradition of rock drumming at its finest. Gorman was born in Muskegon, Michigan where he began playing drums in his elementary school band. In 1987 Steve moved to Atlanta in order to focus on his music, and met brothers Chris and Rich Robinson. While Steve is best known for his work with the Black Crowes, he also has worked with the British band the Stereophonics, Robert Plant and Jimmy Page and John Corbett. Mike Brignardello is a renowned Nashville session bass player and founding member of “Giant”. Mike continues to play on hits heard around the world by today’s biggest Country stars, including Faith Hill, Taylor Swift, LeAnn Rimes and Dolly Parton. Reece Wynans is one the most notable Blues and Rock keyboard, piano, and organ players of all time, having played with Stevie Ray Vaughan and Double Trouble. Reece has also recorded and performed with the Allman Brothers Band, Jerry Jeff Walker, Kenny Wayne Shepherd, Martina McBride, Trisha Yearwood and Buddy Guy. The Brothers of the Southland are part of the great Southern Rock tradition. Some of them played in Southern Rock bands since the 1970s, but all of them carry the South deep inside them. Their music is a powerful, rumbling Rebel yell, from an aching moan to the wide open joy that only Southern Rock can bring. When you listen to the Brothers of the Southland, you're hearing more than just songs; you are confronted with an emotional truth whose roots is planted deep in Southern soil. Produced by D. Scott Miller. Recording, Mixing & Mastering Engineer: Pat Murphy. Additional Recording: Steve Crowder, John Saylor, Leslie Richter, Mike Bush. Recorded at Ocean Way Studios, Nashville, The Parlor, House of Murphy. Photography : Kathy J. Piper. Package Design : Anne Carroll, Brandon Gower. Executive Producers: Mike Figlio, Rush Hicks, Joachim “Jochen” Becker.